With disturbing headlines about domestic violence so often in the news, it's not difficult to understand the damaging situations victims of family violence frequently face. People may not realize that pets in violent homes are often hurt, too. Animals in these situations are silent victims, who may be threatened, injured or killed by a violent family member to control or intimidate other members of the household. Just like other family members, animals need a safe haven. 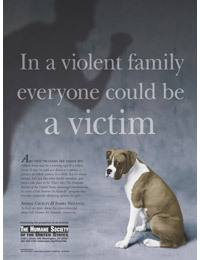 During one week every April, The Humane Society of the U.S. highlights the importance of Safe Havens for Animals programs, which involve collaborative relationships between domestic violence shelters, animal shelters, and community agencies and businesses such as veterinary hospitals to provide temporary housing for victims' pets. All cats and dogs need to wear collars with city or county licenses where required by law, and up-to-date rabies vaccination tags. Personal ID tags are essential backups. Keep your cats indoors and tagged. Many stray cats that end up at shelters are indoor cats that have slipped past an open door or out of an open window. Keep an up-to-date file with a written description of your pet that includes his size, markings, weight, and unusual features. Keep a current photo on file to use for posters or to take to the animal shelter should your pet become lost.